Glashven is a large, beautifully decorated Edwardian villa, set back from the road within a quarter of an acre of grassland, and lovely views over the Sound of Mull. 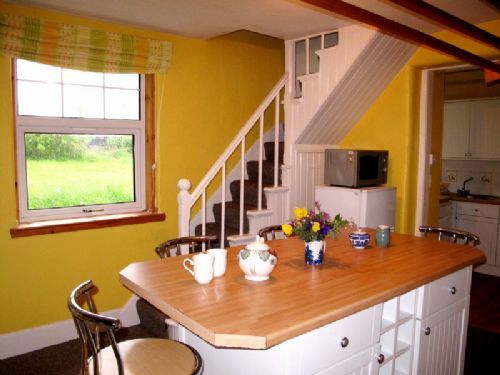 Set in the crofting village of Kilchoan it is a short walk from a friendly, local pub, shop, tearoom and regular ferry sailings to Tobermory, on the Isle of Mull. Forget any idea of highland hospitality! The lack of anything to welcome us felt like a bad start (no washing up liquid, soap... flowers) and mean spirited. It is sad to see such a fine old house neglected and seemingly unloved. Two of the bedrooms are fine, if you like old furniture, which I do, but the other two bedrooms are not suitable for adults. All the furniture feels tired, worn and cheap. The 1950's is not a good look! The kitchen and scullery are really badly laid out for working in, or for sitting. Having these old plastic covers on the armchairs in the sitting room is frankly rather insulting. The fumes from the Rayburn have been commented on by others and the electrics are idiosyncratic and consistently trip the fusebox. Steadings looks after this property so badly that I wonder if it is the same for all their other properties. On arrival, despite pleasant emails, I got the impression that Steadings just doesn't care. Although the Steading office is next door no one ever approached to greet us. There was no welcome or Information pack. To be asked to read the meter and pay extra for electricity (£20 for the week) seemed very petty since the rental in high season was already a lot of money. I really think you should be ashamed of yourselves but my sense is that you just don't care! This is a really nice, spacious and quirky house. It was perfectly clean and equipped with everything we needed. Every year for a get together we stay in Kilchoan in a Steadings home and this one was up to the usual excellent standard as the ones we have booked previously, and even closer to the pub. No they all know by now. Very good hotel for food and drink.